Tickets available at the door. Price: $15, $10 SFEMS/Seniors & Students. Though Dowland was probably the pre-eminent lute-song composer of his era, much of his reputation rests with his compositions for solo lute, among which are arrangements of popular tunes of the day and settings of some of his own best-known songs. The genius of his original solo compositions are exemplified by his fantasies for lute, several of which are included in this program. HOWARD KADIS has been an active performer in the Bay Area for over 40 years. He received his M.A. in music from Cal-State Hayward where he studied lute and guitar with the late James Bertram. He has also studied guitar with Robert Strizich and Michael Troester. Mr. Kadis has been a frequent performer with the San Francisco Opera orchestra as both a guitarist and lutenist, having participated in performances of several Baroque Operas (Handel’s “Julius Ceaser,” and “Alcina,” Monteverdi’s “Coronation of Poppea,” and “The Return of Ulysses”) as well as productions of “Don Pasquale,” “The Barber of Seville,” (including their 2013 and 2015 productions), “Otello” and “Falstaff.” He has performed as a mandolinist and guitarist for the San Jose Opera Orchestra, the Joffrey Ballet, The Sacramento Ballet, and the San Francisco Ballet orchestras. Mr. Kadis has appeared numerous times with the San Francsico Symphony, having participated in their Grammy-winning recordings of Mahler’s Symphony No. 7 and Symphony No. 8 at Davies Hall and in the Symphony’s 2006 and 2007 European tours. He has also appeared with the San Francisco Symphony as a guitar soloist in the “Final Fantasy” concerts in 2009 and 2010. In addition, he has worked with the Santa Fe Opera, the San Jose, Napa, and Santa Rosa Symphonies. 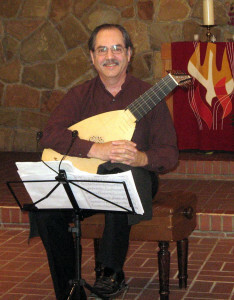 As a solo lutenist, he performed several times as a guest of the Oregon Shakespeare Festival, at the Berkeley Early Music Fringe Festival (2008, 2010, 2012 and 2014), and as a continuo player in numerous early music concerts throughout California. Back to Fringe Concert Calendar.